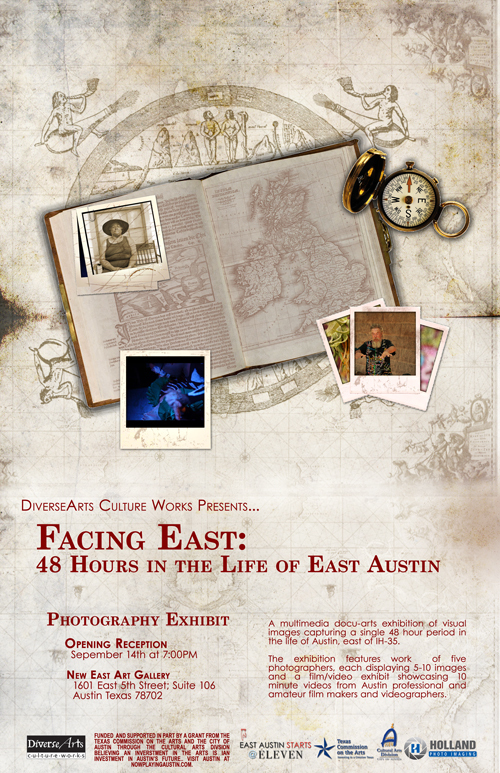 DiverseArts is pleased to announce the opening exhibition of its annual photo-documentary project, “Facing East: 48 Hours in the Life of East Austin.” Various artists, working in photography, took to the streets of East Austin to document this historic and culture-rich area. Taken as a whole, the works selected for public viewing form a snapshot of East Austin, filtered through the diverse viewpoints of the artists themselves. The “Facing East” project captures slices of time, enabling reflection upon the changes taking place in East Austin as well as how its past continues into the future. Ultimately, the entries will become a permanent part of the East Austin Black History Project and Blues Family Tree Archives These DiverseArts efforts hope to address the lack of collected archival materials documenting East Austin history and culture. “Facing East” is part of founder Harold McMillan’s larger mission for the Austin Blues Family Tree Project and the East Austin Black History Project. The Blues Family Tree Project is a living record of Austin musicians and artists’ oral histories and performances created in an effort to address the large-scale scarcity of collected archival materials that document the pre-integration Austin Black Music Community. The East Austin Black History Project expands this mission to include documentation of the personal lives, neighborhoods, businesses and institutions found east of IH-35. In December 2007, the Austin City Council designated Central East Austin an "African American Cultural Heritage District." "Facing East" serves dual purposes: to further the development and appreciation of this cultural heritage district and to document East Austin's vibrant cultural community through the creative lenses of Austin's resident artists.